Deliberations, decisions, and other activities of the Supreme Court of the United States (SCOTUS). Array ( [wp_query] => WP_Query Object ( [query] => Array ( [post_type] => any [posts_per_page] => 10 [suppress_filters] => 0 [tax_query] => Array (  => Array ( [taxonomy] => category [field] => slug [terms] => supreme-court ) ) [orderby] => date [order] => DESC [paged] => 1 ) [query_vars] => Array ( [post_type] => any [posts_per_page] => 10 [suppress_filters] => 0 [tax_query] => Array (  => Array ( [taxonomy] => category [field] => slug [terms] => supreme-court ) ) [orderby] => date [order] => DESC [paged] => 1 [error] => [m] => [p] => 0 [post_parent] => [subpost] => [subpost_id] => [attachment] => [attachment_id] => 0 [name] => [static] => [pagename] => [page_id] => 0 [second] => [minute] => [hour] => [day] => 0 [monthnum] => 0 [year] => 0 [w] => 0 [category_name] => supreme-court [tag] => [cat] => 48 [tag_id] => [author] => [author_name] => [feed] => [tb] => [meta_key] => [meta_value] => [preview] => [s] => [sentence] => [title] => [fields] => [menu_order] => [embed] => [category__in] => Array ( ) [category__not_in] => Array ( ) [category__and] => Array ( ) [post__in] => Array ( ) [post__not_in] => Array ( ) [post_name__in] => Array ( ) [tag__in] => Array ( ) [tag__not_in] => Array ( ) [tag__and] => Array ( ) [tag_slug__in] => Array ( ) [tag_slug__and] => Array ( ) [post_parent__in] => Array ( ) [post_parent__not_in] => Array ( ) [author__in] => Array ( ) [author__not_in] => Array ( ) [ignore_sticky_posts] => [cache_results] => 1 [update_post_term_cache] => 1 [lazy_load_term_meta] => 1 [update_post_meta_cache] => 1 [nopaging] => [comments_per_page] => 50 [no_found_rows] => ) [tax_query] => WP_Tax_Query Object ( [queries] => Array (  => Array ( [taxonomy] => category [terms] => Array (  => supreme-court ) [field] => slug [operator] => IN [include_children] => 1 ) ) [relation] => AND [table_aliases:protected] => Array (  => wp_term_relationships ) [queried_terms] => Array ( [category] => Array ( [terms] => Array (  => supreme-court ) [field] => slug ) ) [primary_table] => wp_posts [primary_id_column] => ID ) [meta_query] => WP_Meta_Query Object ( [queries] => Array ( ) [relation] => [meta_table] => [meta_id_column] => [primary_table] => [primary_id_column] => [table_aliases:protected] => Array ( ) [clauses:protected] => Array ( ) [has_or_relation:protected] => ) [date_query] => [request] => SELECT SQL_CALC_FOUND_ROWS wp_posts.ID FROM wp_posts LEFT JOIN wp_term_relationships ON (wp_posts.ID = wp_term_relationships.object_id) WHERE 1=1 AND ( wp_term_relationships.term_taxonomy_id IN (48) ) AND wp_posts.post_type IN ('post', 'page', 'attachment', 'faq', 'news', 'mailmunch_page') AND (wp_posts.post_status = 'publish' OR wp_posts.post_status = 'acf-disabled') GROUP BY wp_posts.ID ORDER BY wp_posts.post_date DESC LIMIT 0, 10 [posts] => Array (  => WP_Post Object ( [ID] => 2627 [post_author] => 1 [post_date] => 2018-07-22 15:38:52 [post_date_gmt] => 2018-07-22 15:38:52 [post_content] => On Monday July 9, 2018 President Trump nominated Conservative Appeals Court Judget Brett Kavanaugh to replace current Supreme Court Justice Anthony Kennedy, who announced his retirement in June. Kavanaugh "helped investigate Democratic former President Bill Clinton in the 1990s working for independent counsel Kenneth Starr. He was on Republican George W. Bush’s team in the contentious Florida recount fight in the 2000 presidential election, then served as a senior official in Bush’s White House." Based on his his past rulings, "Kavanaugh is likely to be a very conservative justice in the mold of Alito or Neil Gorsuch. Predicting exactly where he’ll fall is harder to do." [post_title] => Trump Nominates Conservative Judge Brett Kavanaugh To Replace Anthony Kennedy On U.S. Supreme Court [post_excerpt] => [post_status] => publish [comment_status] => closed [ping_status] => closed [post_password] => [post_name] => trump-nominates-conservative-judge-brett-kavanaugh-replace-anthony-kennedy-u-s-supreme-court [to_ping] => [pinged] => [post_modified] => 2018-07-22 15:38:52 [post_modified_gmt] => 2018-07-22 15:38:52 [post_content_filtered] => [post_parent] => 0 [guid] => http://factualuprising.com/?p=2627 [menu_order] => 0 [post_type] => post [post_mime_type] => [comment_count] => 0 [filter] => raw )  => WP_Post Object ( [ID] => 2162 [post_author] => 6 [post_date] => 2017-07-29 22:48:42 [post_date_gmt] => 2017-07-29 22:48:42 [post_content] => On February 1, 2017 President Donald Trump nominated Justice Neil Gorsuch to replace the vacant seat due to Justice Antonin Scalia's death. On April 8th, 2017, Justice Gorsuch received his commission as an Associate Justice for the Supreme Court of the United States. "The final vote was 54-45, mostly along party lines." "With a series of choreographed parliamentary maneuvers, Republicans were able, by majority vote, to abolish the longstanding rule that required 60 votes to cut off debate on a Supreme Court nomination." This parliamentary maneuver was the decision to engage the "nuclear option" procedure. In this procedure the Senate is able to act requiring only a simple majority of 51 votes as opposed to the super-majority of 60 votes. Gorsuch's decisions have thus far aligned most with Justice Thomas, the court's most conservative member. Gorsuch is considered to hold a "strict originalist interpretation of the constitution", meaning "he is committed to reading the meaning of the document basically word for word, as he believes the Founding Fathers would have intended it 230 years ago." [post_title] => Neil Gorsuch Confirmed As New Supreme Court Justice To Succeed Former Justice Antonin Scalia [post_excerpt] => [post_status] => publish [comment_status] => closed [ping_status] => closed [post_password] => [post_name] => justice-neil-gorsuch-succeeds-justice-antonin-scalia [to_ping] => [pinged] => [post_modified] => 2017-07-29 22:48:42 [post_modified_gmt] => 2017-07-29 22:48:42 [post_content_filtered] => [post_parent] => 0 [guid] => http://factualuprising.com/?p=2162 [menu_order] => 0 [post_type] => post [post_mime_type] => [comment_count] => 0 [filter] => raw )  => WP_Post Object ( [ID] => 1420 [post_author] => 1 [post_date] => 2017-02-02 21:50:43 [post_date_gmt] => 2017-02-02 21:50:43 [post_content] => Neil Gorsuch was confirmed on April 8 2017 to replace former Supreme Court Associate Justice Antonin Scalia, who died February 13 2016. Obama nominated Merrick Garland to fill this vacancy but after 293 days it expired. Republicans refused to even entertain this nomination and did not hold a single hearing to discuss Garland's qualifications. This was the longest period of inaction for a supreme court seat nomination ever by the Senate. In other words, even if a nomination is rejected or withdrawn, some action is usually taken in some form at some point. For the first time, the Senate (led by Republican efforts) refused to take any action whatsoever. This delay in filling a Supreme Court Justice seat lasted 420 days, making this the 8th longest vacancy period in supreme court history. All 7 longer vacancies were in the 1800's, including the longest vacancy of 841 days after Judge Henry Baldwin died in 1844. 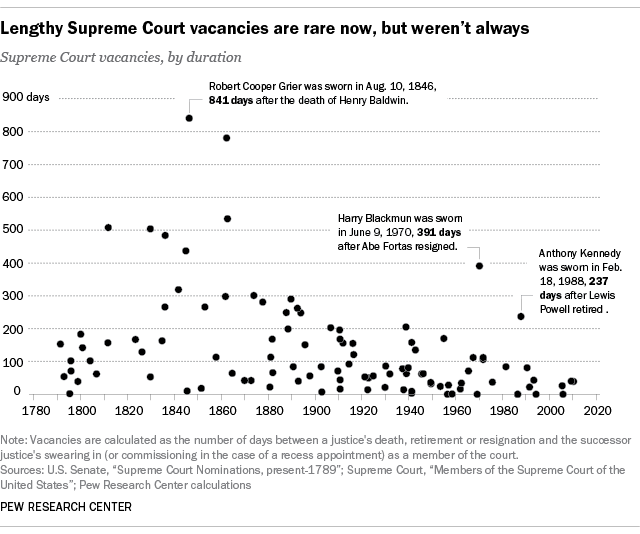 Typically after retirements or resignations the vacancy periods are shorter "because it’s become common for departing justices to make their official retirements contingent on the confirmation of a successor".